Suspenders are made from a soft, stretchy elastic with metal clips and adjusters that adjust from 30" to 37" that fits (on average) ages 5 years to 10 years old. Suspender clips have plastic Mylar inserts that help to prevent snagging the pant waist band and also helps clips to grip better so the suspenders don't fall off. 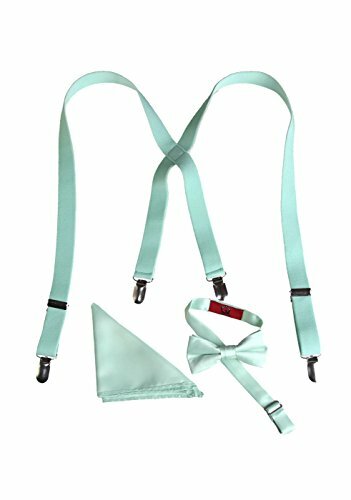 This set is made from high quality material compared to your average suspender bow tie set and is still priced very reasonably.